Moving from traditional manual methods to product development with Delcam’s CADCAM software has enabled Brazilian footwear manufacturer, Macboot, to develop and evaluate numerous alternative designs for each new product, and still get the new designs to market faster. Macboot was founded more than twenty years ago by its current president, Mr. Marco Aurélio Silva, in the Franca region of Brazil. From the start, the company has operated the “human-environmental” philosophy of its founder, pioneering the implementation of sustainable measures in the manufacturing process. In addition, the company has always innovated to improve the performance of its footwear, with shielding to increase the durability of products, novel ventilation technology and advanced waterproofing. These developments have made Macboot a unique company in its sector. After evaluating the various solutions available, Macboot opted to acquire both technologies from Seacam, Delcam’s partner in Brazil. First, in 2008, Macboot acquired PowerSHAPE Pro to develop sole designs and ArtCAM to design decorative items. 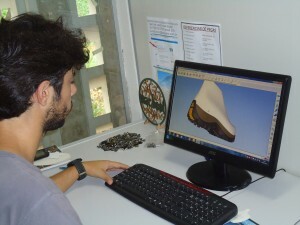 Subsequently, Delcam CRISPIN’s ShoeMaker software was added for upper and sole design, plus Engineer Pro for 2D pattern engineering and grading. Most recently, Macboot acquired a 3D printer to produce durable plastic prototype parts from the designs created in the Delcam software. The successful implementation, based on deadlines and requirements determined by Macboot, was made possible by close collaboration between HomeCAM, Seacam’s sub-dealer for Franca and Nova Serrana regions, Seacam and its suppliers Delcam and 3D Systems. Another important partner was the local technical school, Senai Franca. The instructors, some of whom were trained by Delcam in the UK, played a big part in the training of staff at Macboot. This school offers these technologies as part of its curriculum so it can continuously provide new talent for Macboot already trained in the use of software.